A strong -- albeit injury-plagued -- year seems to have carried over into the offseason for Sixto Sanchez. 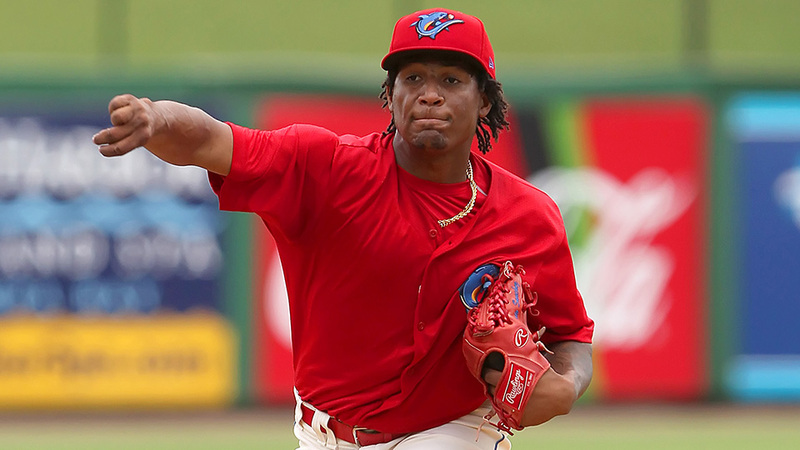 The top Phillies prospect will reportedly skip the Arizona Fall League after he experienced soreness in his right collarbone while working out in the Florida instructional league. According to NBC Sports Philadelphia, team officials are not concerned with the latest setback and remain confident he will be ready for Spring Training. The 20-year-old was in the midst of an All-Star season for Class A Advanced Clearwater when right elbow inflammation sent him to the disabled list on June 9. An MRI came back clean and the club hoped it was a short-term setback, but Sanchez did not pitch for the rest of the season. "There was nothing that was shown that told us that he needs surgery," Phillies player development director Joe Jordan told MLB.com at the time. "Obviously, everyone knows who he is. We're concerned just because of the fact that it's him, but again we're putting him on the side for a couple weeks and let it calm down and see where it goes." MLB.com's No. 21 overall prospect went 4-3 with a 2.51 ERA and a 1.07 WHIP while holding opponents to a .224 average in eight starts in the Florida State League. The right-hander yielded two earned runs over his last 25 2/3 innings spanning four starts, including a seven-inning shutout in his final outing of the year on June 3. Signed out of the Dominican Republic in 2015 as a shortstop, Sanchez was nearly unhittable in his stateside debut in the Rookie-level Gulf Coast League the next year. The 6-foot, 185-pounder went 5-0 with an 0.50 ERA in 11 starts and followed that up with a strong season with Class A Lakewood and Clearwater in 2017, going 5-7 with a 3.03 ERA and a 0.96 WHIP in 18 starts. Sanchez was scheduled to pitch for the Scottsdale Scorpions in the AFL. Philadelphia GM Matt Klentak confirmed to NBC Sports that the Phillies were pulling their top prospect out of the league.